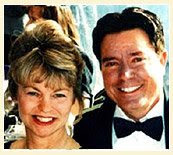 Dr. Kenneth G. Townsend (shown here with his wife, Vicky) has been named the new director of the Association of Christian Schools International (ASCI) Northwest, serving Alaska, Idaho, Montana, Oregon, and Washington. Dr. Townsend assumes this position with over 29 years of experience in Christian schooling and 30 years as Chaplain, Colonel in the United States Air Force Reserve. He served the last four years as the Associate Director of the Northwest Region. Ken retired last summer after 30 years as a Grace Brethren chaplain. At his retirement ceremony in June, he was awarded the Legion of Merit, a prestigious medal awarded to military officers who have demonstrated a distinguished career of service in the U.S. Armed Forces. He was also recognized during the annual conference of the Fellowship of Grace Brethren Churches in July at Tampa, Fla. In his new position at ASCI, he succeeds retiring Roger Norrie in the Vancouver, Wash. office and will begin his director responsibilities on July 1, 2009.